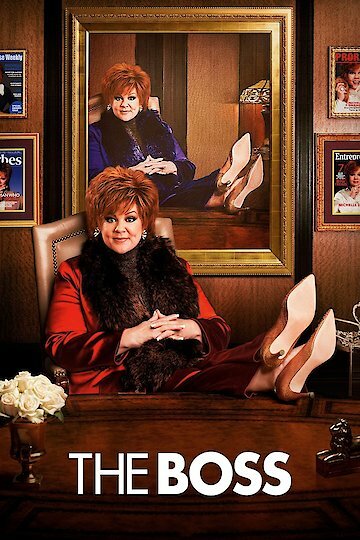 In this Melissa McCarthy comedy, business tycoon Michelle Darnell rules her world and all that surrounds her. She is motivational to many and has a large following. That is, until she finds herself in prison. Michelle is an investment guru who eventually gets caught for insider trading and ends up in prison. When she is released, she doesn't have many trusting followers left. Her trusty and seemingly pathetic assistant Claire takes Michelle in temporarily. Claire has a small apartment with her young daughter and Michelle brings all of her personality and authority to the apartment and their lives. Claire's daughter, Rachel, is in a Brownie troop. After attending a meeting non-voluntarily, Michelle sees the Brownies as her way back into the investment world. The girls are taken on many silly adventures to make Rachel's Brownie group a success while enemies are made and schemes are drawn up. Meanwhile, Michelle is learning what family and friendship really looks like. The Boss is currently available to watch and stream, download, buy on demand at FuboTV, FX Networks, FX+, FOX, Amazon, Vudu, Google Play, FandangoNow, iTunes, YouTube VOD online. Last week, Batman v Superman saw a big drop-off in its ticket sales but held on to first place anyway. This week, the rapidly fading superhero movie faces much stronger competition and faces its first second-place finish. Last weekend showed that Batman v Superman would be vulnerable if it faced any real competition at the box office. This weekend, more formidable competition arrives.